This new bag from Mulberry, the Mulberry Del Ray, is named after and inspired by the singer Lana Del Rey, from her references to glamour from a bygone age. This is what the Del Ray bag epitomises – it’s a timeless and luxurious style, a modern day classic. The bag is a bowling bag shape, softly structured and made from spongy grained leather. The bag has a top zip fastening with and a flap over pocket at the front, which features the iconic Mulberry postman’s turnlock fastening. All the metal hardware on the bag is softgold in colour, including the padlock for locking the zip – the key to which is contained in the leather fob. The bag has two structured rolled leather carry handles. When you undo the zip you will find a spacious compartment, lined in Mulberry tree fabric, with a zip fastening pocket and a pouch pocket. 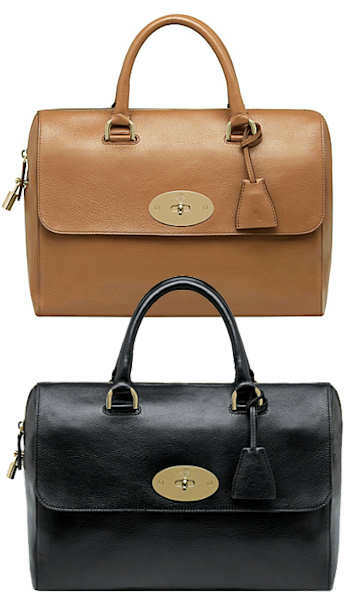 Practical, iconic and elegant, the Del Ray is a new modern classic from Mulberry. This bag can be carried in your hand or worn on the crook of your elbow. 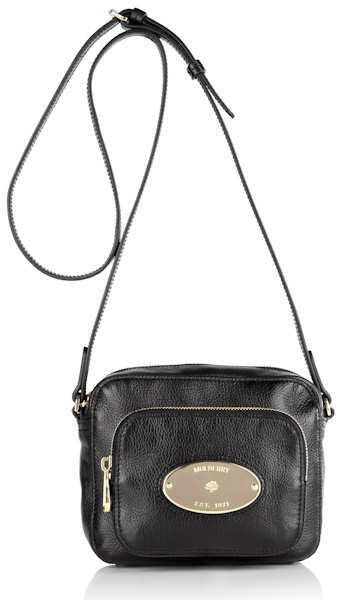 The Mulberry Gracie Bag is a cute, miniature cross body bag which is made from soft, spongy leather. It has an external zip pocket which stand proud on the front of the bag. This pocket bears the oval Mulberry plaque. 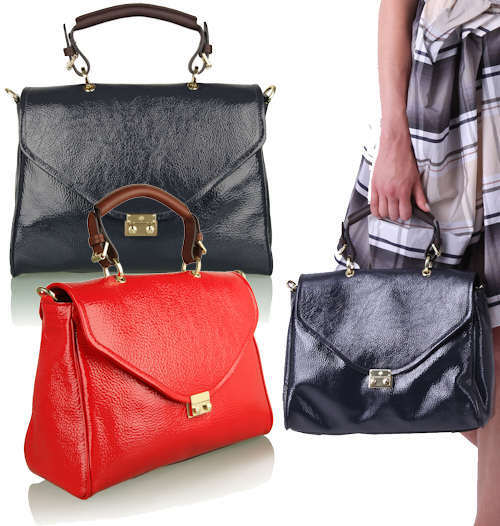 The bag has a top zip fastening and an adjustable leather shoulder / cross body strap. The zip pulls are oversized and all the metal hardware on the bag is pale gold in colour. Inside, the bag is lined in black Mulberry tree fabric and there is an oval black leather Mulberry label and a pale gold Mulberry fob. 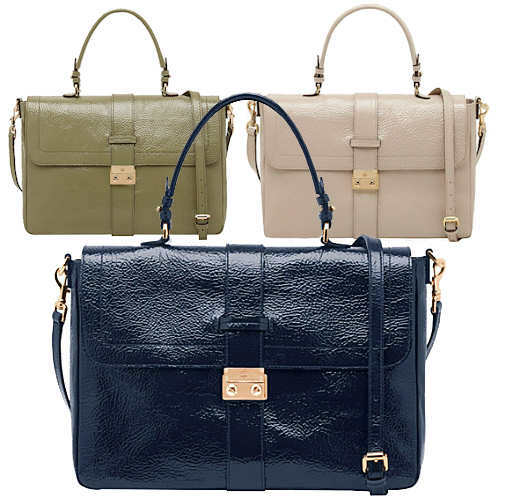 Style note: The Gracie bag can be used in many different ways and it is incredibly versatile. You can wear it cross body or over your shoulder; you can tuck the strap inside and use it as a clutch, or you can use it as a bag inside bag – for example, use it as a purse inside your large bag during the day – then slip out this bag for after work cocktails. Perfect! 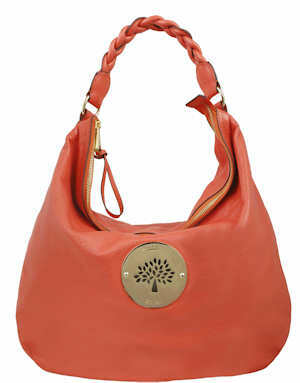 The Mulberry Bella Hobo is a bucket shaped bag made from soft, spongy leather. It has a single shoulder strap with branded buckle adjustment and a top zip fastening. It also features the antique brass Mulberry oval plaque on the front. This is a brand new bag from Mulberry for the new season. Other features including two zip pulls which can be locked together with a miniature padlock, with the key contained in the classic leather hangtag. Inside, the bag is lined in signature Mulberry tree print and there is a slip pocket and a zip pocket, with a Mulberry metal fob and leather label. Style note: This is an easy to carry, soft and slouchy bucket bag in Mulberry’s gorgeous spongy leather, that you can wear over your shoulder or carry in the crook of your elbow. It is a contemporary update of a classic style, and as such is timeless in its appeal, so you will be able to use it season after season and remain “bang on trend”. 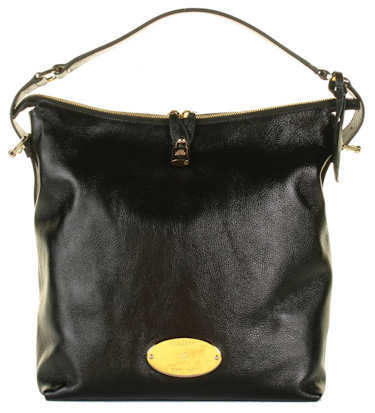 This Mulberry Lily Shoulder Bag is made from spongy patent leather. It is a cute shoulder bag with a flapover, the iconic Mulberry postman’s lock fastening on the front and it has a bang on trend chain and leather handle. All the hardware is gold in colour. This bag can be worn over the shoulder, cross body, or used as a clutch if you tuck the handle inside the bag. The bag also features a hanging leather fob, complete with horse shoe charm. Inside, this bag is lined in brushed leather (very nice) and there is a zip pocket with the branded logo. Measurements: 17cm x 21cm x 9cm; handle drop 29 cm; (all measurements are approximate). Style note: The Lily is a small, relaxed, yet extremely upper class bag which would be a cool and sumptuous addition to any outfit. This Mulberry Neely Bag is made from spongy patent leather and is available in Steel or Tomato red. It is an envelope flapover messenger bag and features gold coloured hardware throughout, including the front push lock fastening and the handle links. There is also an additional magnetic clasp under the flap for extra security. You may have also noticed the D-rings on the side of the Neely – this is because the bag is supplied with an optional brown leather fully adjustable cross body / shoulder strap which attaches to the d-rings with lobster clasps. The bag is carried in the hand using the single, sturdy brown leather curved carry handle. Inside bag is lined in signature Mulberry material and has a leather trimmed pouch pocket and a zip pocket. Measurements: 30cm x 34cm x 14cm; handle drop 11 cm; (all measurements are approximate). Style note: The Neely has miniature briefcase features and is so versatile – you can carry it in your hand or the crook of your arm using the brown leather top handle, or over the shoulder or cross body using the included shoulder strap. For work or play, there is no nicer daily use handbag than Mulberry’s latest creation. If you are interested in trivia, you will want to know that this bag is named after the lead character in the Valley of the Dolls. 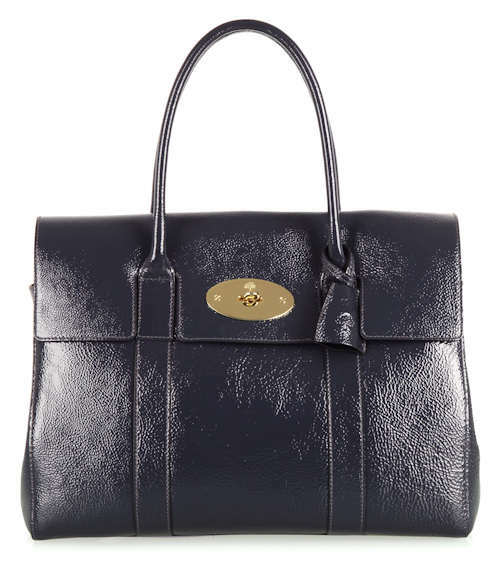 This new Mulberry Bayswater from the new 2010 / 2011 season is constructed from steel coloured spongy patent leather, with a postman’s lock front fastening and a matching padlock. All the metal hardware on the bag is gold in colour. There are feet on the bottom of the bag for protection. Inside, it is fully lined in black suede and there are two pouch pockets and one zipped compartment, with leather belt straps to adjust the width of the bag to create extra space. Measurements: 36cm x 26.5cm x 16.5cm; handle drop 15.5 cm; (all measurements are approximate). Style note: The super luxe Mulberry Bayswater has been introduced in a wonderful blue grey shade for the new season. It will go with many looks, but curiously looks very good with denim. The Mulberry Daria Hobo Bag bag Ivory is made from soft spongy leather featuring large Mulberry branded studs at the base of the handle. This bag has a single plaited shoulder handle and a top zip fastening. All the metal hardware on the bag is golden in colour, including the large golden Mulberry plaque on the front of the bag. Inside, there is a zip pocket and a pouch pocket and the bag is fully lined in a cream coloured grosgrain material. There is also a Mulberry leather label stitched inside with a branded gold-tone fob. Measurements: 48cm x 45cm x 10cm; (all measurements are approximate). Style note: The Mulberry Daria Hobo in tangerine is a gorgeous summer bag and will go with anything, but look especially great teamed with navy, red and mixed floral ensembles. Made of beautiful soft and spongy leather, this bag will just get better and better with age. 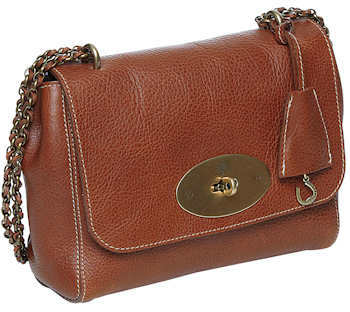 Click here to view all Mulberry bags currently in stock.